Baby's Breath is easy to identify due to its soft and lacy appearance. It can be used to provide a backdrop for more vibrant garden blooms. It is also grown as a filler plant for creating flower arrangements. In some areas of the world, this plant is considered to be invasive. It can be found growing in the wild in fields and disturbed areas. Many species have been developed to allow for growing almost anywhere. Gypsophila is a common sight in many gardens intended for cut blooms. There are annual and perennial plants available through the species. It is often grown as an ornamental plant and valued for its flowers. The plant grows one to two feet tall, depending on the species. Bloom color is often white, with some species producing pink blooms. The stems appear delicate, producing many tiny blossoms to enjoy. G. Paniculata is among the most common species found in gardens. It is frequently grown and harvest for its beauty in arrangements. It produces many delicate blooms that compliment many flower types. G. Repens produces lilac colored flowers that are more unique looking. While not as common as other species, it is used for flower gardens. It is a lower growing species, suitable for edging and containers. Baby's breath is durable, and can adapt to rough soil conditions. It often flourishes in chalky soil, ideal for rough areas of lawns. For potted options, a more fertile soil can be used if it drains well. To get more alkaline soil, lime can be added when preparing beds. A small handful can also be added around the base of the plant. Organic plant matter can be added to the soil to increase quality. Blooms are often best if the plant is crowded in its growing space. To achieve this, there should be minimal spacing between the plants. It does not often spread widely, but perennials will seed for years. Full light is preferred in order to grow and produce the most blooms. Partial sun may be used but it may impact the amount of growth. It is often planted above other plants to produce flowers all season. This plant is naturalized in Europe but has established in the US. It is most commonly found in the eastern parts of the United States. Only four species are regularly used for gardening or decorating. Due to its easy cultivation, it is often available all year long. Some may plant early in the year while others plant later for blooms. Some may grow it in greenhouses to have access to year round flowers. Upon realizing its many uses and accessibility, Baby's Breath has appeared in Fort Smith, AR, Richardson, TX, Lexington, KY, Tempe, AZ, and Lawrence, KS within recent years. They have started making appearances in many other locations across the country as well. This flower is used as a symbol of purity and being pure of heart. It can also be used as a symbol of innocence for garden decorating. Depending on its use, the symbolism may not be the focal point. Florists often cultivate this plant for its uses in arrangements. There are many reasons it is used to create bouquets or center pieces. It is rarely used as the focal point in any vases or arrangements. The most common use is as a filler for any bouquet or gift basket. This is because the delicate blossoms spread and fill in bare spots. It allows the other flowers to stand out more as it appears subtle. This is common for table arrangements as it can fill in empty areas. 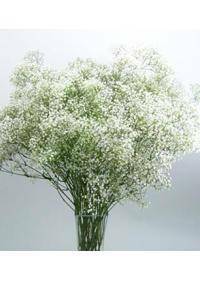 Examples may include one or two large blooms surrounded by gypsophila. The flowers may also be placed around candles or other centerpieces. Another popular use is to dry flowers for use in dried arrangements. These last a long time without losing color or becoming too brittle. This makes baby's breath a versatile plant for florists and gardeners.